"There comes a time when every murloc must choose a side. Will you mrglgglllgl for the Horde alongside Legionnaire Murky, or dive into battle for the Alliance at Knight-Captain Murky’s command?" It's unclear if players will be able to collect both murlocs, à la Moonkin Hatchling, or if redeeming a BlizzCon murloc will grant only one faction's pet. 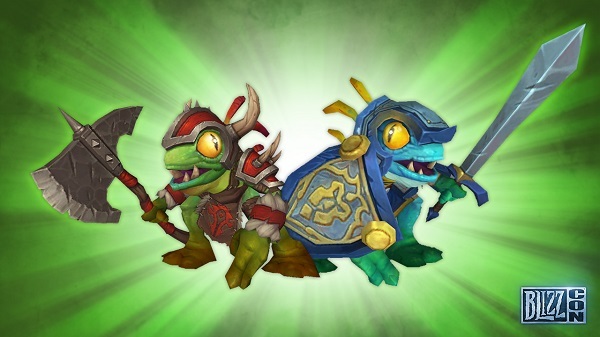 We certainly hope it's the former and collectors will be able to obtain both Legionnaire Murky and Knight-Captain Murky. Hopefully some clarification will come soon. Received my two pets yessterday in my pet collection tab. A notice popped up when I logged on. Knight-Captain if you summon on Alliance and Legionnaire on Horde. This pet, Murkalot, P/P blackfuse bombing is my 100% win rate team. Oh, I hope we can have both, it would just be unfair if we couldn't, and we ARE paying real money, after all. Fingies crossed! I am looking forward to the answer... Hope it comes soon. With 2 different apparent weapons sets I would hope that each of these pets would be available separately and each have their own move sets. The alliance with a shield: Possible tank spec like Anubisath Idol? What would be really cool is if they had interactions like the Blue vs Red battle bots. All in all cute pets. The wording suggests to me that they are just being cute. The murlocs are making a choice of Alliance or Horde. Seems unlikely that you have to pick one or the other. They probably should have worded it so as not to given even a hint of that impression. Hope this works like the Moonkin like lots are saying. Update: I do believe we'll get both, it seems kind of glossed over, but over the picture, it says "World of Warcraft® – Legionnaire Murky & Knight-Captain Murky". Still hopefully, it will be better clarified. Also on the buy virtual ticket page, on the in-game goodies overview, it says you'll get the "pets".